Both sites get most of the traffic coming from google search engine. In this point MRC is much better indexed than MSXDirect because there is much more content to index. I now it sounds a bit like if I was setting a sort of competition, but it's not my intention: the fact is that MRC is a very good model of self maintained website and that's exactly what I am aiming... besides the fact MRC is the nº1 English MSX site. If I am contacted, well, I'll be happy to discuss what ever they have to say to me... and if legal action is taken, the site will have to be closed down. As simple as that. I'm not going to fight Konami, am I? -But until then, many people will be able to enjoy games and programs that in other ways are more difficult to find. I am not harming anyone but my self, so what's all the fuss about this? It might not be a bad idea to educate yourself about Project Egg. The fact that you have software available on your site might make a company to decide against putting their old MSX software available through Egg, because it's pirated all over the place anyway. That, is extremely harmful to the future of MSX. Saying you've never had news from (former) MSX companies does not mean there's nothing new. If you would've followed the news as reported here on MRC a bit more closely (like anyone TRULY interested in MSX would do), you would've known about the renewed commercial interest in MSX. I don't know what 'msx community' you're referring to, but I get the feeling it's a different one from the one I (and many thousands of others) belong to. If you truly had a heart for MSX, you'd say NO to piracy. Copy = crime, and you're guilty. Well, I've made my point about old wared and the piracy theme. Sorry we have different opinions, but that has nothing to do about beeing a MSX user or fan and enjoying old time games. There's some thing else I have'nt said: 3 years ago, with the mobile phones sales raising I would have said that MSX had a chance to be comercial again (wouldn't you love to play Metal Gear 2 on your Nokia?). Unfortunately that chance was lost: right now phone CPUs and memory are thousands of times faster and larger than our old MSX. 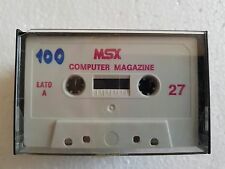 To be honest I don't think there's a comercial future for MSX (sorry, I now that hurts!). Anyway: that's just my point of view. I might be wrong. Time will say. Hey, I don't see the point on getting nasty about this. We are all MSX Fans... with diferent opinions. In the early days many people were guilty of copying games a lot. It may have been a good idea at the time for them since that was the only way to get many titles without paying (much) for it. It's illegal and we had to pay for that with the way premature ending of commercial MSX in Europe. Many titles were put online on the net on several locations (I really don't know how many and where exactly) and even though it's illegal, it did reactivate people who used MSX in the past and even got people who never heard of MSX to start using it. The latter is mainly done by the coming of MSX emulation programs (like the CJS MSX(2) emulator, fMSX and MSX4PC and later some more like RuMSX, NLMSX, openMSX and of course the official ASCII MSXPLAYer). The coming of new MSX enthousiasts is always a good thing for the MSX community, even though many people will discuss the way they came in contact with MSX in the first place. Warez for any system (not only MSX) is illegal and because of MRC policy and the fact software companies who made MSX software in the past are frequent visitors of the MRC we do not allow sites with mainly or only illegal material. As you may have noticed in this thread already many people can't wait for a revival of MSX to come and MRC posts quite some news about it. Even though many MSX enthousiasts have (re)found their way to MSX I agree asking for warez or providing warez is illegal and is not allowed on the MRC in any way (links, news, forum, whatever other means available on MRC). It's not only the right thing to do, but also for our protection. Let's do it as well !!!!! JEames, you don't believe in a commercial future for MSX? It's already happening, dude. I do wonder if you follow the news about the 'MSX Revival' at all. It seems like even if I press Project EGG or the MSX Association activities in your face, you still don't know what I'm talking about. I fully agree with GuyveR800 here. You think we shouldn't make such a fuzz about it? I think we should. We should discuss this until the end, it's an essential and very important issue. And please also dig into our newsarchive: you will notice that konami released many of their old msx games for mobile phones in Japan (for now). They are made in Java for Mobile phones. If you look what´s happening at the moment in europe, you will notice that companies like Vodaphone also signed contracts with Taito, Sega and many others to release their old 8 bit games on mobile devices. ou can find this news also in our archive. Please dare to say again that companies don´t have any interest in their old games. It´s simply not true. Shutting down your site by legal order, and all the penalties involved won´t happen right away by the legal copyright owners. And it won´t happen too with only a few visitors. But it will happen when your site gets the traffic you want it to have. Capcom already sued some sites. It´s just a matter of time before other companies will follow. Msx.org doesn´t want to be associated with any illegal sites, content etc. Because we personally had some issues in the past with some Japanese companies already we will stick to this policy. Another thing is that I really welcome any additional effort for the MSX community. To bad our calls for help to make this site even better aren´t answered, people rather try to invent the wheel again themselves. So many people started enthousiastic with their own wheel, just to find out that maintaining a community site with one person (themselves) doesn´t work in the long run. That results in a dead sites, and people with good skills who eventually stop doing anything for MSX, because they felt left alone. Ah well, my mother always say people are stupid because we all have to make the same mistakes to learn from it in the end. but every msx veteran played this game back those days. That is the point in my last post, all are talking about warez is bad but did every one who voted have or had the original sofware.... don't think so. So i'm not telling warez is no problem, not at all... yes i think it killed the european market in the '80 but i think it can help the "revival" of msx. And yes... the copyright holders are right but a little too late... i think. But than again this (a piece of) is my opinion. The last big MSX developments (basically Konami and other major game industries) were done 10 or 15 years ago. That is an eternity in computer entertainment. 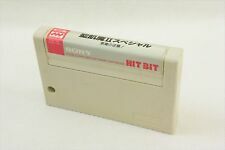 So: if some big company decides to re-promote the MSX system, what ever they are promoting, will certainly NOT be the MSX system but a new system capable of executing the old ROMs and software. Well... and what do we have now? PCs with linux or windows capable of executing MSX software via emulator. You can even find emulators that work on PDAs and that’s just so close to a mobile phone that it make’s no sense to reinvest on a new system. So: what's the point in reintroducing MSX? -Purely a commercial and marketing manoeuvre; trying to get the enthusiastic people that has a good opinion of the word “MSX” but what ever they do now, it won’t be no where near what we all have in mind for a MSX computer. Newer games and developments for small devices will and are been developed for much more advanced hardware than the old Z80 and similar. So where in this scenario is a place for our old MSX and all it’s software? –May be in Japan they got a few mobile devices with MSX software working, but that’s the past. No one will invest now on that kind of platform when mobile hardware and software are years light from the old MSX. So, and getting back to the initial point: why game industry can have any interest in old software developed 10 years ago? –I just can’t see the reason. They might want to remake the same games with new technology but I think the old msx versions are really useless for them. Apart from all this is the strictly legal issue. Yes, I now warez and piracy is illegal. But I am not making nor going to make any profit from it, so honestly I don’t feel guilty about it. In any case it is really my problem. If copyright holders have any interest in closing down my site it will be closed. I bought my SD-Snatcher in 1990, for ~72 euros (new, only used for a magazine review) and still have it. At that time I owned Metal Gear and Usas too, together with several other Konami games (I was one of the first people in holland to buy Nemesis 3, it just came in ^_^), several other cartridge games (e.g. Bubble Bobble, Hydlide 3), many european disk-games, countless cassette games, and also recently imported Sorcerian and Xak - the Tower of Gazzel. Right now, warez may be able to increase the MSX userbase somewhat, but they mostly attract emulator users. How many emulator users buy new games? It's only a VERY small fraction. In order for MSX to revive (or even survive!) it is not enough to have users that play old games. It is important MSX users buy new games and/or actively playing a role in the MSX scene. My challenge of the day: Although warez can attract some nostalgic MSX'ers back to MSX, WWW warez sites attract mostly pirates.